The Strongest Light-duty Wheel Lift on The Planet! Lil’ Hercules comes as either standard L arm-wheel grid, or the self-loading Herc-O-Matic. Our Herc-O-Matic is the self-loading version of the Lil Hercules Wheel Lift. It features a 6-function control system, and automatic jaws for quick vehicle grab-and-go recovery. The Strongest Tubes on the market. Our Tubes have extensive reinforcement. Our Tubes do not have slop. Bronze Oil-Lite Bushings at all critical Pivot Points. Just like a large Wrecker would have. We use a Bronze Brushing that has Oil impregnated into them. They Sweat Oil. This creates little or no maintenance. Our Units are built Heavy Duty every step of the way. No one builds a better lift. Lifetime Warranty on all Pins & Bushings. The Lil Hercules™ has a 4 & 6 function controls, comes standard with a 15’ corded controller. I’ve had em’ all Dynamic, Century…(the Lil Hercules) is the best unit I’ve ever had. There’s no repairs, I’ve never had any issues. What you say it is, that’s what it is. I see the other guys out in the middle of the night with their other systems, and they are always working on them man. I’m on the road 7 days a week. We used cutting-edge CAD technology to create the design to build the strongest, most versatile wheel lift on the market. Our team constructs each piece, by hand, to ensure solid construction and strength at all connections. We have strategically reinforce areas that are known to have issues in other designs, to prevent weak spots from occurring. We also strategically reinforce the truck frame before mounting the Lil Hercules™ wheel lift. Lil’ Hercules comes as either standard “L” arm-wheel grid, or the self-loading Herc-O-Matic. Our Lil Hercules™ product line is the leader in underbody wheel lifts, showing up the competition at every turn. Despite its incredibly lightweight construction, our Lil Hercules™ boasts a 4,000lb lift capacity, 8,000lb towing capacity, 3,500lb extended capacity, and a 65’ reach capacity, Our ultra-tough design allows for heavy duty workload from a lighter duty vehicle, without compromising the vehicle’s GVWR. That saves time and money on spring or frame repairs down the road. Time off the road, is time that you are not earning. If your equipment breaks down, it slows you down, it costs you money to repair, and costs you in lost time where you not making money. Our solution is simple, build a better, stronger and smarter product. The little extra you pay now for the Lil Hercules will save you money on repairs and keep you on the road 7 days a week. The Lil Hercules™ features a 12 volt pump with an 8 minute duty cycle (that’s 4 TIMES stronger than industry standard issue). All of our pivot points are fabricated in-house, and constructed with our unique two-piece hexagonal nut-and-bolt design pin system, and our signature oil-infused bronze bushings. These require less maintenance than other pivot point systems, because the bushings literally sweat oil. Our pivot points are the strongest on the market, and will never corrode and freeze up. They last longer, require less maintenance, and are backed by a lifetime warranty. That means you spend your time on the road making money, instead of in the shop, paying for repairs. If you have a Lil Hercules™ or Herc-O-Matic installed on the back of your truck, you’ll enjoy our adjustable nut-and-bolt pivot pin. Instead of the traditional construction of a one-piece 1018 steel pin for the pivot head on a wheel lift, we use a two-piece, heavy-duty hexagonal bolt that can be tightened into its nut. That means not having to come into the shop and pay for service and replace that little pin every few years. Instead, as it loosens, you can quickly and easily give it an adjustment, and carry on carrying on. Looking to get your own Lil Hercules Standard L-Arm Wheel Grid unit or the Self-Loading Herc-O-Matic by Detroit Wrecker Sales, just click on the links below for our current catalog and customizations. Or feel free to give us a call to discuss your options. Want to Finance your Lil Hercules™ wheel lift? No problem. We work with two good companies that you can consult with to see if you qualify for a loan and most times at a really great rate. Even if you have bad credit you might qualify, so check out the link below for more information. 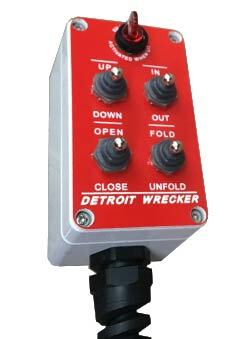 All of Detroit Wrecker Sales, signature products are built from scratch, right here, in our Detroit shop. Our expert fabrication team make all the parts and pieces in-house, so we know it’s done right. We use quality materials, and experienced welders, machinists and mechanics. We can ship the Lil Hercules™ to you, or we can install it for you in our manufacturing and customer service facility. We also carry extensive inventories of repair parts from ALL tow truck manufacturers. The Strongest Self-Loading Wheel Lift on The Planet! Our Herc-O-Matic is the self-loading version of the Lil Hercules™ Wheel Lift features a 6-function control system, and automatic jaws for quick vehicle grab-and-go recovery. A 15’ corded hand-held control comes standard with the Herc-O-Matic, or you can opt for the wireless remote controller. The Lil Hercules™ products have 4 & 6 function controls. The Herc O Matic comes standard with a 15’ corded controller. We also offer a wireless remote control. The Lil Hercules™ Herc-O-Matic standard wired control. We also offer a wireless remote control. In 2011, Detroit Wrecker came out with a response to the market’s need for a new underbody wheel lift that eliminated the most common problems affecting repossession wheel lift operators. The goal was to design an underbody wheel lift with a wide variety of improvements on the current industry standard design. We wanted to create a wheel lift that was up to the challenge, a workhorse of a wheel lift that could stand up to any task, and perform under pressure. The Lil Hercules™ is stronger, easier to maintain, and easier to operate than any other underbody wheel lift on the market. At Detroit Wrecker, the mission is always to set the standard for the industry, in the level of quality control, craftsmanship, and structural finesse of the unit. We created a product line designed to address and eliminate the common flaws associated with traditional underbody wheel lifts, and gave it a name reflective of its strength and durability. The Lil Hercules™ series was born. Common flaws with traditional underbody wheel lifts include using thinner steel tubing for the construction of the unit, and skinny steel pins for the pivot points. These two issues often lead to the unit sustaining damage from corrosion, or buckling under the pressure of trying to move more weight than it can support. Detroit Wrecker’s Lil Hercules™ products are built using ¼ inch steel tubing, instead of industry standard 3/16 inch tubing. That’s not enough for us. We reinforce our steel tubing with another ¼ inch of steel reinforcement, for a ½ inch total thickness. That’s three times thicker than the tubing on traditional wheel lifts. Then we coat it with black powder coat to protect from corrosion. Like everything we build, our Lil Hercules™ products feature thick steel pins and our signature Bronze Oil-Lite bushings. These bushings are infused with oil, so they need less frequent maintenance, and, with proper care, will last a lifetime. Our Lil Hercules™ and Herc O Matic feature our adjustable nut-and-bolt pivot pin. It’s a two-piece, heavy-duty hexagonal bolt that can be tightened into its nut, instead of the traditional one-piece 1018 steel pin construction. What’s the difference? Our model is easy for you to adjust, so as it loosens, you can easily adjust it, instead of having to bring it in for service or replacement. Our Lil Hercules™ and Herc O Matic are stronger, tougher, and work harder, for longer, than any other wheel lifts on the market. Their rugged design and structural reinforcement gives them the power to handle whatever you need to tow. You can watch a video of the Lil Hercules™ lifting another tow truck here. Lil Hercules™ owners worldwide are proud of their Detroit Wrecker products. The level of effort in our original designs and manufactured products are unparalleled, and our customers confidently extend their satisfaction by spreading the word, and sending their friends to us for all their towing equipment and recovery needs, as well as service, repair, mods and improvements. We are the only towing equipment manufacturer that covers pins, bushings and craftsmanship with a Lifetime Warranty. Our Lil Hercules™ designs will continue to evolve and improve to offer the best available options and solutions for customers worldwide.